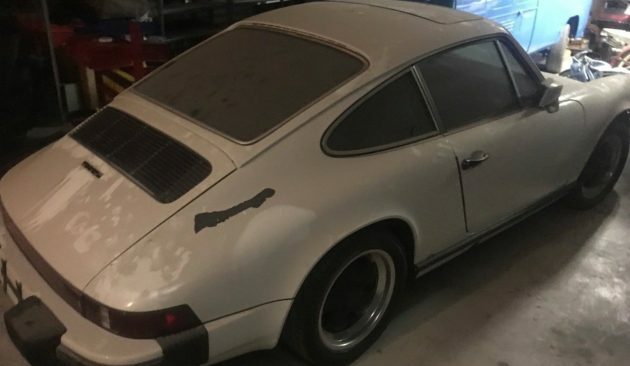 This 1977 Porsche 911S has already attracted bids over $20,000 with plenty of time left in the auction. 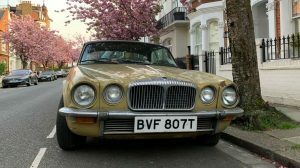 The car is part of a larger collection of vehicles that the seller is clearing out as part of his father’s estate. This particular example sports some nice options from the factory and mostly original paint. Find it here on eBay with bidding at $22,300 and four days left. This 911S was optioned with sport seats from the factory. Though hard to see here, they are a nice factory upgrade and appear to be in good shape. 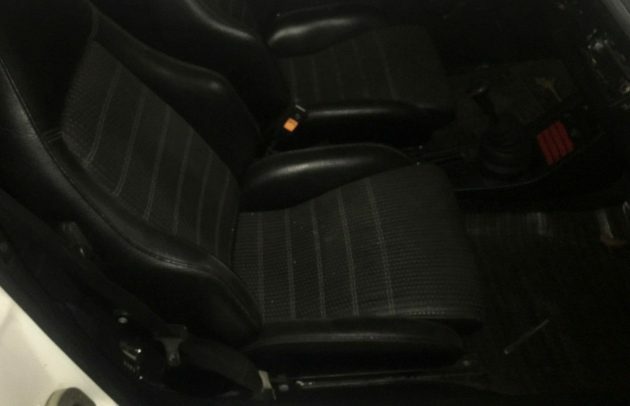 The seller points out that it comes with ample records, including the original lease agreement, and that the head studs and tensioners were replaced before they purchased the car. 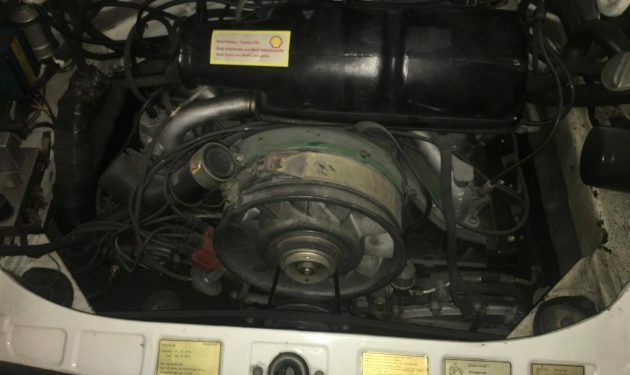 The engine is said to be dry and without leaks. No rust and zero body damage are also listed as selling points. Finding original, accident-free examples is getting harder and harder to do as good cars are snatched up as investments. The fact that this one has been hiding in a collection for 20 years ago certainly increases its appeal as it’s not just some tarted up project rolled out at the right time. The seller’s dad seemed to be quite an enthusiast, with a full race trailer and living quarters also listed on eBay, evidence of their commitment to trackside-living. Nice car and I love the body style but in looking at other Porsche 911s around the same era it seems as though this one is just a little bit overpriced since you can buy one without paint issues for 5 to $7,000 more that hasn’t been sitting for the past 20 years and probably needs a ton of maintenance done immediately before driving. Am I wrong? I am not a Porsche expert by any means, just my opinion from looking around. I think what he was saying was that he could buy it for 6-7k MORE than the auction price with good paint. Read what I actually said before spouting your verbal diahrea. Oh and what’s wrong with rice burners? There is a real possibility that I am a peasant. I really like European cars but have never owned a Porsche of any description. Several of my friends have owned various models and have allowed me to drive them. I always came away underwhelmed by them. Maybe my expectations were just too high. At the risk of sounding too picky, why would anyone advertise a very desirable (read expensive) Porsche without spending a few bucks for a wash, wax, detailing job?? New to the market are you? Because barn finds are all the rage and people pay more for the dust. So much so that guys are taking found cars, spraying them with water, and reversing a wet/dry vac on them to try and simulate the look you see here. People are more into buying the “story” on these cars, than the actual car sometimes. IIRC the ’77s were the last of the 2.7 engined cars, with weak engines that could pull their head studs and require rebuilding. The seller says the studs and chain tensioners were replaced, and that he has every receipt from new. I would want to see the receipts for that work and either hear it run or at least get a compression test. As Rx7turboII points out, this car is no bargain. I would want to know that it doesn’t need an engine rebuild after paying the $25K+….final price unknown since the reserve hasn’t been met. And it does have 160K on the clock…..
Adam T45: I have the same attitude as you, and I felt the SCs were underpowered, which makes these 2.7 cars even more so. I think they look terrific, but on the road: underwhelming. Properly prepped 2.7’s driven near the edge are as fun as it gets,heel n toe,counter steering,trail breaking,line set up,hot apex exits CMON! Problem is to drive the early car’s hard takes skill. I owned a 1979 911sc Targa back when they were simply cool old sports cars and not Certificates of Deposit. Still one of the funnest cars I have driven, in spite of its quirks and higher cost to own. The 3.0 engine was wonderful and powerful enough to carry it to 150 mph. That said, I would probably opt for a water-cooled version next time around for all-around drive ability and bang for the buck- you can pick up a clean one for around $15k. Get the Porsche out of the way and show more of the VW type 2 single cab!!! I don’t want to start another ( Porsche) war, and if you like 356’s, that’s fine, but for a third of the cost of the haggered 356 earlier, you can have this fantastic sports car, that has little, if anything, in common with a VW. This would leave the poor 356 in it’s dust in 3rd gear. I’ll never be able to afford these cars, but for those that can, THIS is what a Porsche is to me. Awesome cars! ( 912 shown) Shifts into 5th at 90,,,that’s what I’m talkin’ about. A Porsche 911 isn’t much until you get past four grand on the tach. Need to be able to drive it like it’s yours. These weren’t built to putter around and be seen in. They were built to be driven like they were stolen! My son had a 911 of this era for about a year. He always wanted one as I did. The looks are fantastic, BUT they are not fun to drive around town as the gearing is made for open roads or the track. 2nd big point, parts are expensive and this one has been sitting. 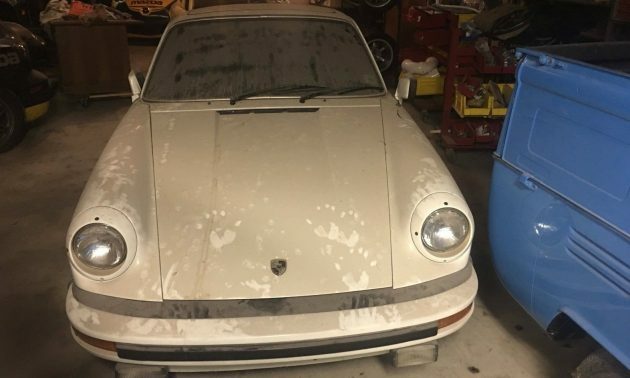 This, another Porsche 911 and a Mercedes are all posted as “from my father’s estate” at a tuning shop. There is a Boxster still coming to be posted.